The following treatise was arguably the most popular book of the short lived Italian Reformation. It is estimated that 40,000 - 80,000 copies were printed between 1541-1548, of which very few remain today due to the fact that most were burned once the title was placed on the list of prohibited books during the Inquisition. The treatise was originally published anonymously under the title Trattato Ultilissimo Del Beneficio Di Geisu Christo Crocifisso, and was for a few hundred years mistakenly attributed to Aonio Paleario (1503-1570), a martyr for the Reformation cause in Italy. 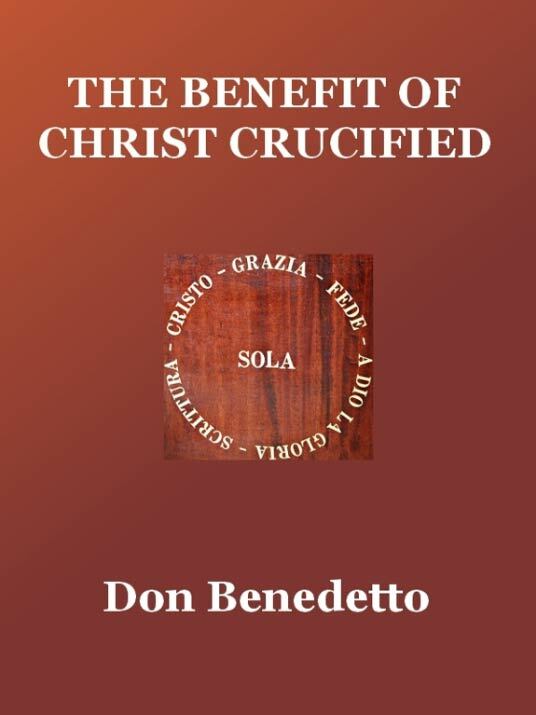 But most scholars now agree, based on records from the Inquisition itself, that the "Trattato" was written by Don Benedetto, a student of the Spanish Reformer Juan de Valdes (1498?-1541) and friend of Peter Martyr Vermigli (1499-1562). This online edition makes use of a translation from the original Italian into English by Edward Courtenay (1548), later edited and modernized in 1855 by Rev. R. W. Johnson (Cambridge: Deighton, Bell, & Co., 1855). CHAPTER I. Of original sin, and of the misery of man. CHAPTER II. That the law was given of God to the intent that we might first know our sin ; and then that distrusting to be justified by our own works, we might run unto the mercy of God, and the righteousness of faith. CHAPTER III. That the forgiveness of our sins, our justification, and all our salvation dependeth on Christ. CHAPTER IV. Of the effects of the lively faith, and of the unity or agreement of the soul with Christ. CHAPTER V. How the Christian man apparelleth or clotheth himself with Christ. CHAPTER VI. Certain remedies against incredulity or unbelief.